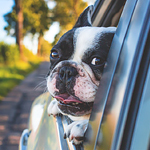 What Makes a Dog-Friendly Vehicle? Nowadays, dogs are going on more car rides than ever, and they're the safest that they have ever been. New vehicles come with temporary barriers, large spaces, pet carriers, pet seats, belts, and harnesses. There are also areas for food and water containers, as well as cargo space that can hold even large dogs. Dog-friendly vehicles are safe spaces where dogs can ride without the dangers of getting hurt. It's safer to bring your dog along in the car if you have them strapped in with a pet belt, for example. If you find that your dog can't sit still, then you should also think about putting a barrier up between the front and back seat. You also want to make sure that your dog is secure, especially if a smaller breed. You can use a pet carrier with a belt to ensure that your dog doesn't move too much in the back.